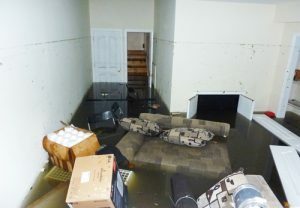 Living on the Jersey Shore, we’re all too familiar with basement flooding. Studies show that up to 95% of all basements may experience a water problem at some point, and that something as simple as a sump pump could have helped to prevent. It only takes one inch of water to cause havoc in your home. Since an inch of water can take hours to clean up and cost thousands of dollars in damaged furniture and flooring, you’ll want a solution. What is a sump pump and how can it help? A sump pump is simply a small pump. It is installed in the lowest part of a basement or crawlspace. Its job is to help prevent flooding and keep the area under the home dry. A sump pump will usually live inside a sump pit in a home. Most sump pumps turn on automatically through a float activator arm or a pressure sensor. As the sump pit fills with water, the sump pump will turn on and begin removing excess water to prevent flooding. Not sure if your home needs a sump pump? One way to check whether or not your home has moisture coming into it is by taping a 12×12 inch piece of plastic wrap onto a part of the basement wall. Then, seal the edges of the plastic wrap with tape. Finally, check the plastic for the next few days, noting when moisture appears. If moisture appears on the side of the plastic facing the wall, that indicates a water leak. If moisture appears on the side of the plastic that faces the open room, that is due to dampness. At A.J. Perri we have years of experience helping our New Jersey neighbors. We can install any sump pump and also offer a time-tested, high quality line of sump pumps to fit all of your needs. We’ll dig the pit and install the pump, as well as install the discharge piping. Get in contact with us today if you find this post especially relevant!